Here you'll find hundreds of products for hydroponics and indoor gardening. The "products" link on the top of each page will take you to the different categories. Try the search form above too. If you want information to get started or just want to read, we have many articles in our learning center. We have lots of technical details about the grow lights and indoor gardening. If you decide to order, you can track the progress of your order from the "my account" link above. This shows your order status, history and package tracking numbers. We also email the order confirmations and tracking numbers. The original Multi Flow Hydroponic System, manufactured by Greentrees Hydroponics since 1992. We've made many different products over the years, but nothing has come close to the success of our Multi Flow Indoor Hydroponic System. The Multi Flow system has individual containers for each plant that can be placed close together for small plants and farther apart for larger plants. Moving plants is simple just lift out the inner pot and set it at a new site. No drippers to fool with because the Multi Flow is a bottom feed, ebb and flow system. The pumps fill and drain the pots a few times each day for even watering. Hydroponic gardening at it's best! Multi Flow 12 Pot Systems come with a Built in Timer, 55 Gallon Reservoir, Level controller, 12 Pots, Tubing and Pumps. A 1000 watt grow light is recommended for a 12 pot system. 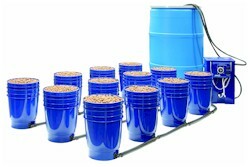 The WaterFarm is a traditional drip type hydroponics system. The WaterFarm is constructed of high impact plastic to assure long lasting performance indoors and out. The square design makes for efficiency when packing many WaterFarms close together, many gardeners will enjoy this optimized use of space. This system will help you save some money without sacrificing quality or performance. The WaterFarm's dimensions are 10"x10"x15" with a reservoir capacity of 2.5 gallons. The WaterFarm Complete comes with the reservoir, growing container, air pump, pumping column, grow rocks, and bottles of nutrient. 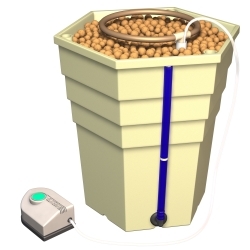 The Power Grower is a recirculating self-contained drip hydroponic system. It has a 3 gallon growing container that sits on top of the 5 gallon reservoir. 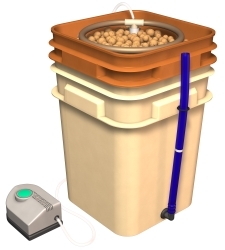 The nutrient solution is pumped to the top with an air pump that sits outside the planter. The plants are grown in Hydrocorn growing media. Each system includes Hydrocorn, pump, all fittings and 3 part Flora Nutrient 8 ounce size, about enough for two months of growing. 15" wide and 15" tall. "If your product is as good as your service, I'll be happy. Thank you for the great service!!!"